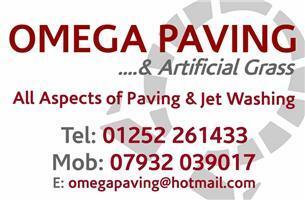 Omega Paving & Artificial Grass - Driveways/Patios/Paths, Landscaper based in Blackwater, Surrey. Omega Paving and Artificial Grass is a well respected professionally business based in Surrey. With over twenty years of experience, our reputation and services are highly regarded as one of the best in and around the area. We carry out groundwork and landscaping projects of all sizes ensuring all projects are completed to British standards. We have an exceptional hardworking and devoted team who will guarantee that all projects are completed to the highest of standards. We cover the whole of the South East, Hampshire, Berkshire, Surrey, Sussex, Buckinghamshire, Oxfordshire and Greater London, installing the best quality driveways, patios and landscaping projects.